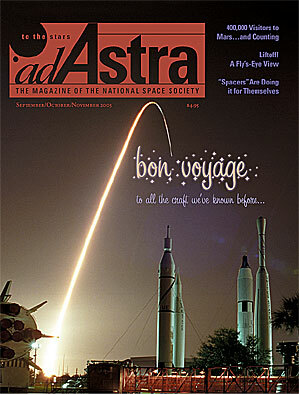 ON THE COVER: NSS Photographer Joe Marino captures space shuttle Columbia in a time-exposed lift off in 1999. Aviation maverick Burt Rutan has his eye on the prizethe X Prize to be preciseand is building a means to capture it. Go along for the ride with Ecliptic Technologies innovative tools for keeping an eye on Space. of Space: Cool Careers on the Final Frontier, meet a woman who dreams of building a Noahs Ark for space. Drawing board or desert flat – these next gen craft never quite got the green light. NSS photographer Jim Marino suits up, trains, and joins the 400,000-plus who have already made the journey to Mars. The U.S. Astronaut Hall of Fame welcomes its four newest inductees.